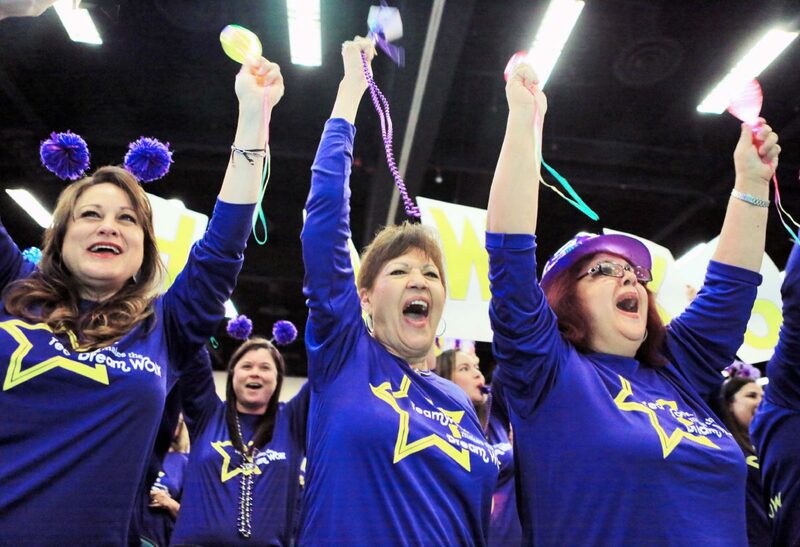 Teachers and staff from Thigpen- Zavala Elementary celebrate as their school is called at the McAllen ISD General Assembly at the McAllen Convention Center on Tuesday, Aug. 14, 2018, in McAllen. McALLEN — The latest state accountability ratings are out, reflecting the first official A through F grades for school districts across the state for 2017 performance. McAllen ISD Superintendent J.A. 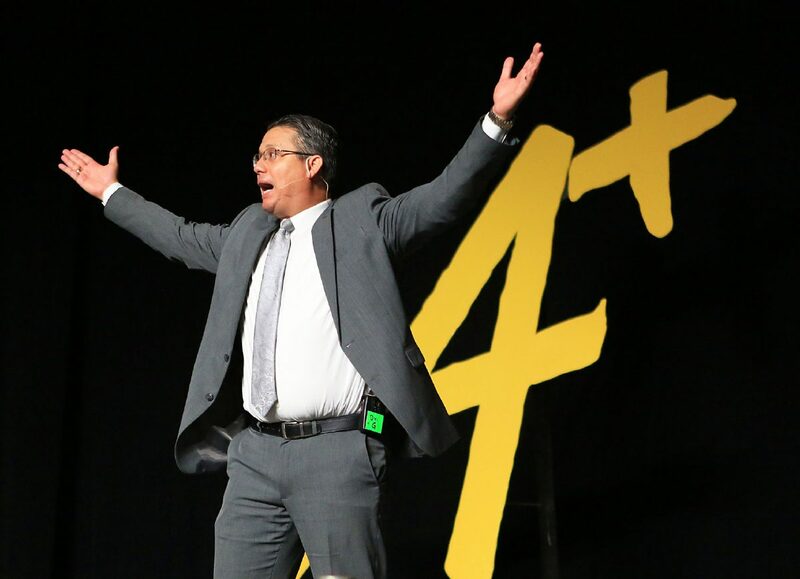 Gonzalez celebrates on stage after the announcement of an A rating by the Texas Education Agency at General Assembly at the McAllen Convention Center on Tuesday, Aug. 14, 2018, in McAllen. 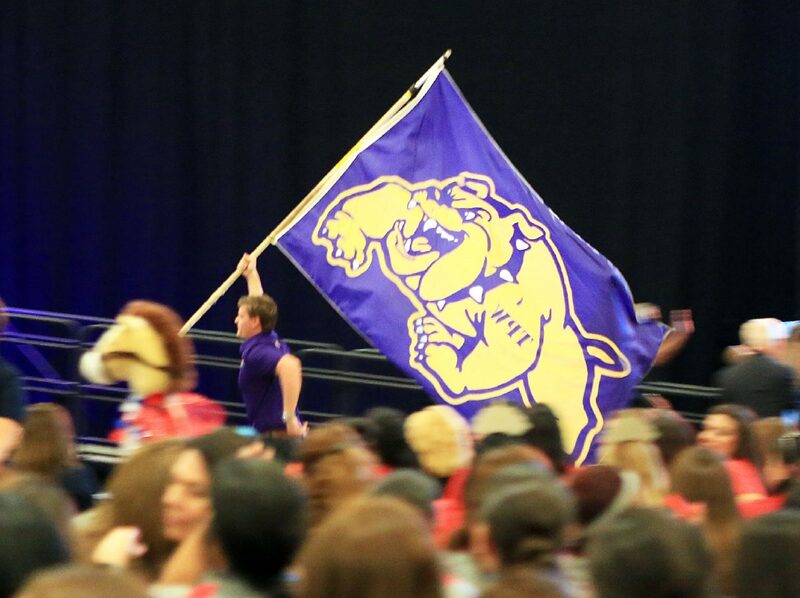 M flag representing McAllen High School is carried past the stage during the McAllen ISD General Assembly at the McAllen Convention Center on Tuesday, Aug. 14, 2018, in McAllen. All of the area A-rated districts have more than half of their student body considered economically disadvantage with most reaching 80 and even 90 percent. On top of the letter grade, seven of these high-performing school districts in the Valley also re-ceived state distinction for postsecondary readiness; they are: Edinburg, Los Fresnos, McAllen, Roma, Sharyland, South Texas ISD and Valley View. In total, 58 school districts and charters received the distinction throughout the state, the only distinction attainable at the school district level. This recognition is based on graduation rates, dual-credit course completion rates, ACT and SAT participation and performance, and Career and Technical Education graduates. The Texas Education Agency also recognized Los Fresnos, Sharyland and South Texas school districts for receiving the distinction for four consecutive years. This is the first year that TEA awards official letter grades to school districts as it transitions out of the former pass-fail system. The former system will still apply for individual campuses, but a “what if” letter-grade will be released for these later this year. The new grades will be A for Exemplary Performance; B for Recognized Performance, C for Ac-ceptable Performance, D for In Need of Improvement, and F for Unacceptable Performance. The overall letter grade for the school districts is based on three new domains, which include: Student Achievement, Student Progress and Closing the Gaps. TEA assigns an individual letter grade to each domain using several indicators, mostly based on STAAR testing scores. Student Achievement, described as how much the students know and can do, rates a district’s STAAR test performance, graduation rates, and its students’ preparedness for college, career and military. The two indicators for Student Progress are: academic growth, which measures how much bet-ter students performed in reading and math this year versus the previous year; and relative performance, which measures student achievement relative to the percentage of economically disadvantaged students. This domain, Morath explains, is important because it allows a district to earn credit for improving student performance based on how they entered that school year as opposed to overall achievement goals. Closing the Gaps measures academic performance of students broken down into 13 groups — including ethnic backgrounds, economic status and special education status — to evaluate grade-level performance, academic growth and the graduation rate, English language proficiency and student achievement. The overall district score, however, is calculated by taking the better score out of just two domains — Student Achievement and School Progress, which will count for 70 percent of the overall grade, and the Closing the Gaps score as 30 percent. By weighing the best out of what students know and can do, and how much a district managed to make students grow throughout the year, eliminates the relationship between student poverty and student achievement. Morath used as an example a student that is behind more than two years at the start of a school year. Even if a teacher is able to get that student ahead by two academic years by the end of the year, they would still perform below grade in academic achievement alone. But by taking student growth into account, they are able to get a better picture of the academic state of the school or district. “The raw student achievement picture of a campus or student that looks like that might not be that great but the level of student growth, the level of school progress that you see is phenomenal,” Morath said. However, the highest-performing school districts in the Valley did not reflect an either-or circumstance, but rather high levels of both student achievement and growth, he clarified. The highest achieving Valley school districts with A grades on all three domains are Shayrland, Valley View, Vanguard Academy and South Texas. This followed by McAllen, Los Fresnos and Roma school districts with two A grades and one B; and Edinburg and Hidalgo with two B grades and one A. In Cameron County there were six B scores for the school districts of Brownsville, Harlingen, La Feria, Port Isabel, Santa Maria and Santa Rosa. As well as two C grades for Rio Hondo and San Benito school districts. Hidalgo County saw a total of 10 B grades for districts including IDEA Public Schools, La Joya and Mission, among others. Two districts received C grades, Donna and Edcouch Elsa, and the lowest grade was a D, received by Mid-Valley Academy, a charter school. Commissioner Morath said Region One, which encompasses the entire Valley as well as the counties of Jim Hogg, Zapata and Webb. He attributed the level of performance to a consistent culture of high expectations and cross-collaboration to identify and spread best practices. TEA’s new website for this year’s ratings is live at txschools.org.